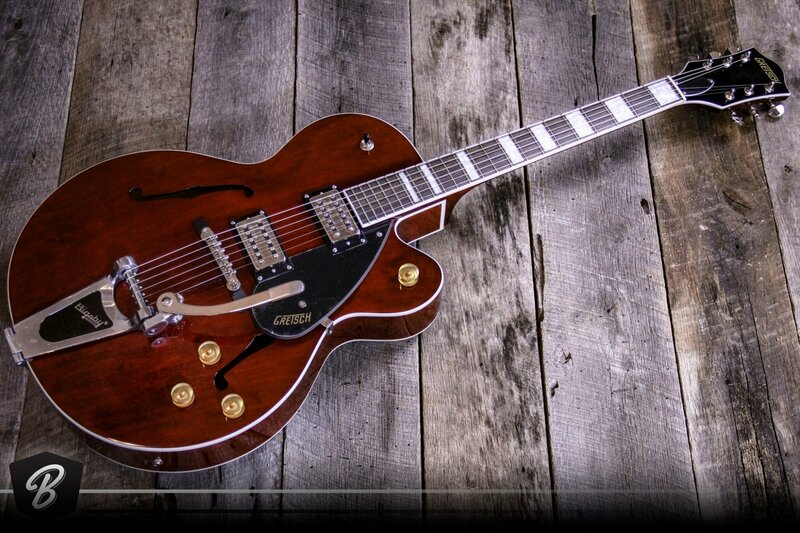 The G2420T Streamliner sticks close to what has made Gretsch guitars look so desirable over the years. A pair of F-holes display the guitar's voluptuous hollowbody. The G2420T is also decorated with vintage-looking, 2-ply white and black binding that wraps the entirety of the instrument. The G2420T Streamliner uses vintage-style construction and a modern electronics package to deliver tones that will fit equally well with a jazz trio as it will with a hard-rocking rockabilly band. The fully hollow design adds warmth and roundness to the guitar's tone. And a Bigsby licensed B-50 vibrato allows for Duane Eddy-style pitch bends. But the custom-wound Broad'Tron humbucking pickups are engineered to deliver plenty of output that can easily put you into hard rock tonal territory. Gretsch's G2420T Streamliner Hollowbody plays and feels every bit as good as it sounds. Its thin "U" neck profile is round enough that chording remains comfortable in all positions, while being thin enough to facilitate fleet-fingered runs. The full-size, single-cutaway construction is comfortable against your body, and it gives you access to the guitar's higher frets. The controls have even been thoughtfully laid out to pull a wide range of tones from the guitar. The Gretsch G2420T Streamliner Hollowbody can blend jazz and rock tones with ease.